The Best One Bedroom in Glass House! 1. It’s on a corner. Throughout the building the majority of the corners are reserved for two bedrooms. The living space seems much larger because of the floor-to-ceiling windows and the abundant natural light. The panoramic mountain views will wow you! 2. It has a true bedroom. This has been one of the favorite floorplans because of the fully enclosed bedroom. Most of the one bedroom floor plans have three quarter height walls and there isn’t a door separating the bedroom from the living room. This feature gives you privacy in case you have guest staying over. 3. It has higher ceilings. That’s right, the ceiling heights in Glass House are typically 10 feet. 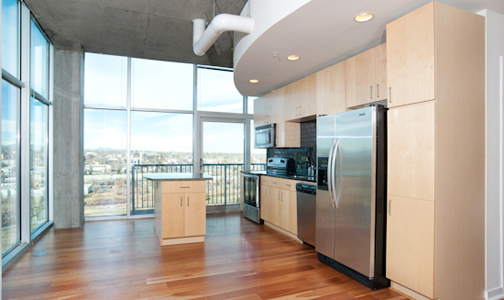 On the 5th, 11th and 21st floors you get 11 foot ceilings. This helps make this home feel even larger. Glass House #1118 is competitively priced and is one of the least expensive homes in the building. It’s well layed out, has a unique floor plan and is perfect for someone looking to live downtown. With all of the great amenities Glass House provides, you will not be dissapointed. This home is offered at $349,000. Please call me to schedule your personal tour at 303.618.3622.